After dinner at Punch with my Madre, we headed over the St. Paul institution that is the Grand Ole Creamery. An ice cream shop that draws Twin Cities denizens to escape the heat of the summer. As its name suggests, the Grand Ole Creamery serves up the heavy creamy stuff in a seemingly endless list of flavors in waffle cones made on site. I’ve enjoyed countless summer ice cream cones at this establishment. It was great to finally return after more than four years. This place is a treat, even in those dark Minnesota winter days. The night before I grabbed my last MN burger lunch with my dad at the Bulldog, I grabbed my last MN dinner with my madre at one of our favorite spots. Punch Pizza takes the Neapolitan pizza seriously. Punch is among the few U.S. restaurants to be certified by Vera Pizza Neapolitana (V.P.N), the Naples organization that oversees that quality of those wishing to take the V.P.N title. Aside from the three letters, the title means that Punch makes some of the best Neapolitan pizza you can find outside of Naples. Better than some I’ve had in Naples. Really freaking good pizza! The certification means an eagle’s eye attention to ingredients and process. The pizza is cooked at 800 degrees in a bell shaped wood fired oven. The high heat creates a crispy crust with a doughy layer under the toppings. The uninitiated might think the crust is burned. It’s not. That crisp, with the occasional blackened spot, is exactly how it should be. It’s a unique style of pizza perfectly designed to celebrate quality ingredients. My mother had the margherita. As always, it encapsulated the prefect simplicity of basil, mozzarella, and crushed tomatoes. I opted for the vesuvio (spiced salami, saracene olive, cracked red pepper, piparras pepper, and basil). The vesuvio was good, but in my selection my mind was too much on one of my favorite Brooklyn haunts, Toby’s. There was just to much going on. I should have kept things simple and ordered the margherita extra, a prefect combination basil, mozzarella di bufala and crushed San Marzano tomatoes. Similar to the regular margherita, but made with absolutely the best ingredients to be found. Eating at Punch took me back to innumerable dinners with friends and family over amazing pies and back to Naples. If you live in the Twin Cities and haven’t made your way to Punch yet, now is the time! My posting has been sparse lately, in part due to an 11 day trip back to Minnesota. A trip that has left me backlogged with food I want to write about. Tragically, the timing and heat of the trip limited the amount of actual cooking I got in. Though, I did get in a couple good grills with the boys. I’m starting off with one of my favorite Minnesota spots that I’ve so far neglected to mention here: The Bulldog. This fine establishment can be found on Lyndale in Uptown Minneapolis–which, despite its name and for reasons I’ve never been able to figure out, is located south of Downtown Minneapolis. Back when I used to live in Minneapolis, I think it was safe to call me a regular. I can’t count the number of burgers and beers I’ve taken down with friends at this spot. So, after working through some of my Twin Cities must eats, this spot was an easy choice for a last lunch with my father. The menu boasts a creative burger menu that is only matched by the Bulldog’s impressive beer list. The burger list includes such amazing creations as the Stilton burger and the Hawaiian. All the burger come with fries and everyone is under $10! (The hot dog menu isn’t shabby either and is worth of an occasional departure from the burgers.) The beer options are heavy on the Belgians but include great bottles from stellar U.S. brewers. On this trip, I set my sights on the Humpty Dumpty (a fried egg, melted cheddar cheese, red onion, shredded lettuce, tomato and mayo). This hangover cure used to come with a slice of ham. And, as crazy as it sounds, I think the burger is better off without it. The egg is a great addition, but the ham just got in the way of the burger. After eating, my dad and I turned to a few games of darts while we worked our way through a bit more of the beer list. Great burgers, beer, and darts with the old man: a near perfect way to wind-down my last days in my home State. It’s been at least two months since I posted a recipe featuring bacon prominently, right? Good, because this one is pretty good, AND you can put it on vegetables and salad, so it’s totally healthy. Just pay no attention to the Paula Deen-esque ingredients, and keep telling yourself that. 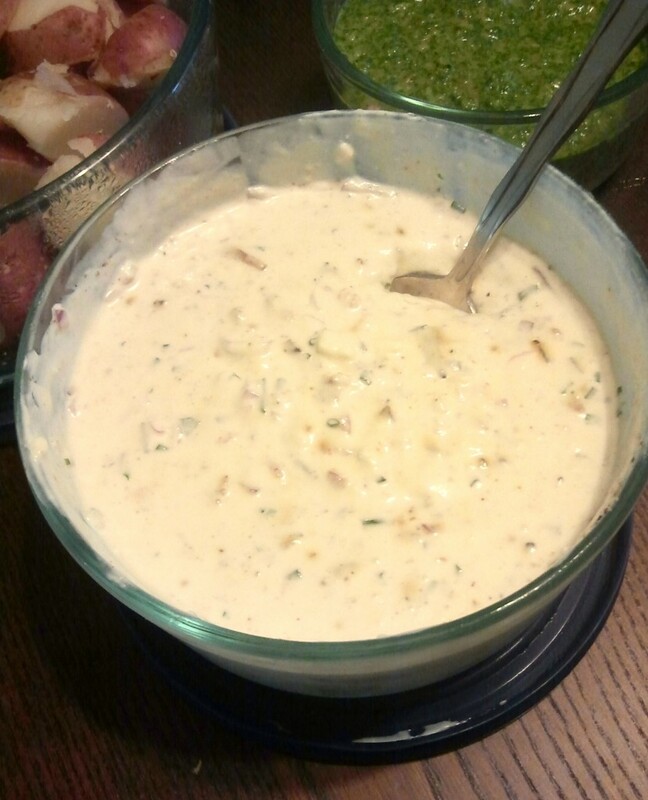 Combine everything but the cheese, bacon, chives and shallots in a mixing bowl and whisk together. Start out by adding 2-3 tablespoons of milk and reserve the rest. Once this mixture is well combined, fold in the remaining ingredients. Now check the consistency and add the remaining amount of milk bit by bit until the dressing has the consistency that you like (keep in mind that if you are going to refrigerate this before serving, it will thicken up a bit). You can also adjust the amount of blue cheese you add, based on your taste for it. I like the taste of the blue cheese in the dressing, but less so the chunks of blue cheese you bite into. I think the next time I make this I’m going to try putting the blue cheese, milk, mayo and sour cream in a food processor to homogenize the mixture. I’ve found this to be a very versatile dip/dressing. It goes well with salad, although its pretty thick and flavorful so it’s easy to overpower the lettuce; maybe add some arugala to balance it out. It’s a great dip for crudites or potato chips, you could put it on top of a burger, and the first time I made it I used it as a dressing on some boiled, cooled red potatoes for a kind of potato salad. Give it a try and let me know what other applications you find for it!